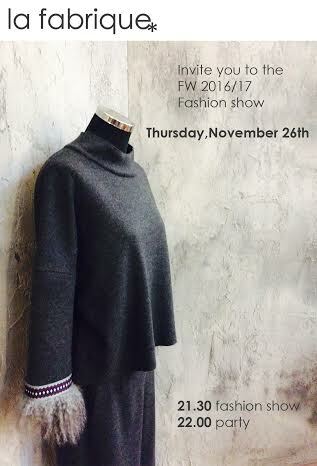 Thursday, November 26, in the Atelier, La Fabrique presented the fashion collection Fall and Winter 16/17. In a surprising red carpet experience, guests were welcomed to the Udine atelier on Via San Daniele. In the evening the models paraded on the catwalk, wearing the suggestions that inspired the Marie-France Russeil fashion collection, perfectly embodying the Nordic mood of the collection. Ethnic trimmings, details in fur, handfuls of wool and wry details, side by side with minimal cuts gave an impeccable glam effect to the fashion collection.